We have to admit that we’re big fans of toast. Not just because it’s delicious, but because of the delightfully nerdy Maillard reaction that makes it so delicious – it’s like eating science! Apparently Hadar Gorelik, a design student in Israel, has the same affinity for browned bread. Her Modular Toaster concept is a triumph for breakfast lovers everywhere. 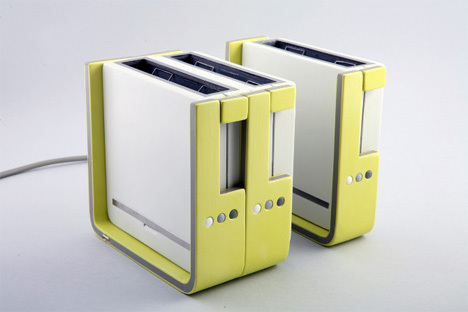 The idea is so common-sense that it seems obvious: rather than getting up from breakfast every minute or two to remove two pieces of toast from a regular toaster and put more bread in, why not make toasters expandable? More slots are added on to the toaster as more people join the family, so no one ever has to wait for their own hot, crunchy piece of heaven. Each toaster unit can be used on its own or they can all be used in concert. 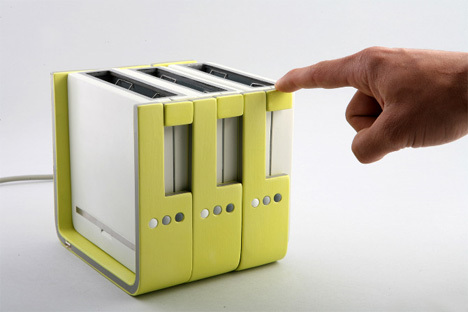 Gorelik points out that on its own, one Modular Toaster piece looks incomplete. 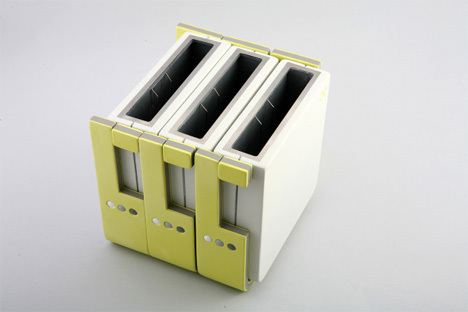 But as you add on more and more modules, the object looks like a proper toaster. As kids grow up and move out, they can take their own parts of the family toaster with them, then start their own little toaster families in their new homes. It’s a rather adorable concept that would no doubt be popular with anyone who loves breakfast or has a healthy appreciation for triple-decker BLTs. See more in Home & Personal or under Gadgets. July, 2011.